There are many myths and rumors circulating that have to do with hair trims. These can range from advice about how not trimming can lead to slower growth to warnings that only a professional can do the job right. If you’re tired of these foggy notions about hair trims, you may want to find out the real deal. First of all, you should know that there is no standard timeframe for when you need a trim. Everyone’s hair is different, so there’s no one time that’s good to have your hair touched up. However, there’s a basic guide that you can follow, recommended by The Beauty Department. Short, cropped hair needs a trim every four to six weeks. This will ensure that the shape of the cut doesn’t change much. In between trims, you may want to use a styling product like Baxter of California – Clay Pomade to ensure that your style remains looking cared for. Hair that’s about shoulder-length should also get a cut every four to six weeks. Many styles will start to flip outward when the hair hits your shoulders, so how long between trims depends on how long or short your neck is. Longer necks could probably go six weeks, while shorter ones might need a trim after four. Layered hair needs a trim every six to eight weeks. This will ensure that the style moves the same way and remains the same shape. A good styling product can help your hair remain soft and smooth in between cuts. Hair that’s medium to long length needs a trim every eight to twelve weeks. This will prevent any split ends from occurring, which could travel up the hair shaft and create frizz and other signs of damage. It’s important to use a conditioning treatment product, in between trims. Very long hair should be cut every six to eight weeks. Long hair has a tendency to get dry, brittle and extremely breakable near the ends, so it’s important to keep split ends at bay. These numbers are subject to change, since all hair is different. Basically, it’s up to you to tell when you need a trim. If your hair starts getting heavy, shapeless and dry, you know it’s time for some TLC. Split ends are also a tell-tale sign that your hair needs to be cut. • Sharp scissors, especially designed to cut hair. It’s best to cut your hair when it’s dry, as wet hair appears longer because it’s weighed down. This will ensure that you won’t cut your hair too short by accident. You should also make sure that your hair is free of tangles. Hamadi – Shea Leave In will make your hair smooth and manageable. 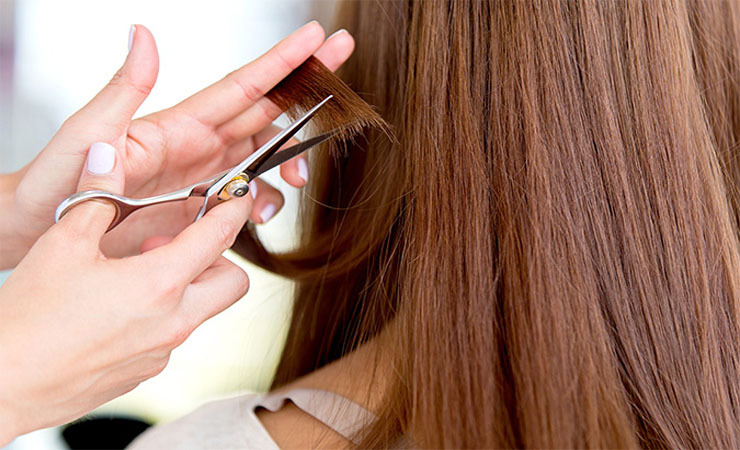 As long as you stay organized while you’re cutting by using plenty of clips, you should be able to give yourself a satisfactory trim. If you’re unsure about the best hair-cutting methods, simply pay attention to your stylist next time you go to the salon, or check out how-to videos online. 06.03.16Top #bbBabes’ of the Month – May 2016! 04.30.16Top #bbBabes’ of the Month – April 2016! 03.30.16Top #bbBabes’ of the Month – March 2016! 02.27.16Top #bbBabes’ of the Month – February 2016! 03.30.15Top #bbBabes’ of the Month – March 2015!